Last winter our family was completely upended. John left me just before Thanksgiving. Then, much of the month of December I was in residence as a research Fellow at the Huntington Library, which meant I lived in Pasadena. This was a mixed blessing: it allowed me space to grieve the loss of my marriage and it gave John time to find an apartment and remove his things from our (or rather, my) home. But it was also hard to be on my own in a new-to-me-city. After having been a wife and a mother for nearly 20 years, it was quite bizarre to be alone in the evenings after the Library closed. The children joined me in Pasadena for the week of Christmas. I knew it would be strange for them to be in a new home away from everything familiar for that week, but it also seemed somewhat apropos because nothing was routine about the rhythms of our lives anymore. Because of my Fellowship obligations (and the crazy-crunch of dissertation-writing in December), right up until Christmas Eve I continued working in the research library for seven hours a day while the kiddos wandered the gardens of the Huntington. In the evening we’d meet in the gift shop, just as the facility was closing down, hanging out there for a few minutes together reading books or giggling over tchotchkes. Then we’d head over to my favorite cafe for dinner. Christmas morning was humble. My biggest presents for the kids (furniture for their room at their Dad’s new place) would arrive after the new year, so they just had few stocking-stuffers to open. And there were a few gifts from my Mom and siblings. While I’d steeled myself for the realization that there wouldn’t be any packages with my name on them that year, it was still a harsh reality to face on Christmas morning. Which is why I felt both surprised and puzzled when the kids passed a square white box in my direction. I opened it to find this sparkly turquoise ball nestled in tissue paper. I bawled so hard as I opened the package, I think I scared the kiddos. But they wrapped their arms around me and held on until I was done. 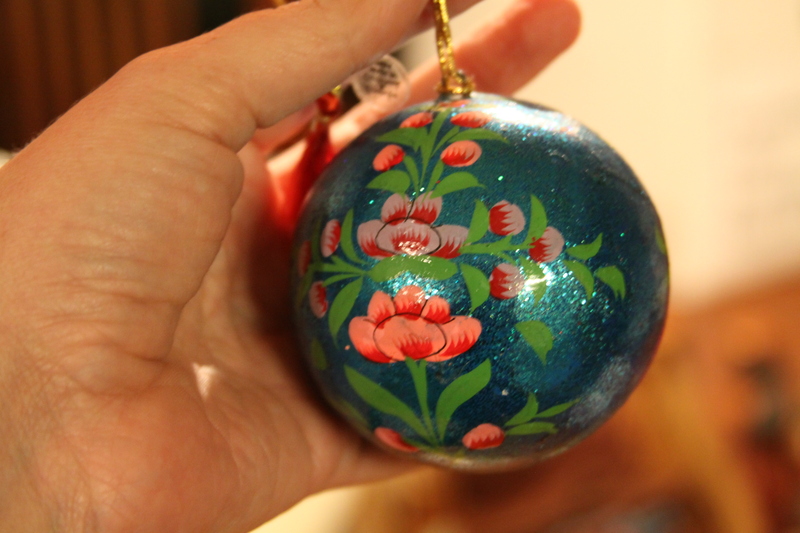 At some point I must’ve shown the kids the turquoise-blue ornament in the Huntington gift shop that was my favorite. It wasn’t particularly fancy, but was blue like the ocean that I missed so much during my Pasadena month. I’d gone to the gift store to buy it for myself on the last evening before Christmas. My disappointment at not finding it in the basket next to the cash register where I’d seen it everyday all month long, seemed par for the course. It was such a silly thing to buy anyway–an ornament–when there were so many other pressing needs in my life. I hung the blue orb in the over-the-sink window of my last home and now it sits permanently on the mantle of my new one (much to the delight of the kitties who like to bat at it and watch it roll). The ornament reminds me of that time in my life when I felt the most alone: I’d walked away from my religious community (and, to some extent my family-of-origin) and then my spouse walked away from me. Though many friends offered to ‘be there’ whenever I needed them, it just wasn’t the same as having one special person who wrapped something ‘just for me’ to open in the morning. And it wasn’t really about the lack of a package–it was about facing a future of mornings when no one would even know whether I was awake, and the loss of that someone for me to cling to through the long dark nights. That the kids understood that even in the midst of their own grief over the changes in our family, meant so much. But this may well be the last year with both kids living at home, so I feel like making the most of whatever familiarity remains, even knowing that it’s not the traditions that matter at all. They’re just the vehicle for sharing our love with each other…one ornament at a time. That last photo says it all. Your children are laughing and smiling, they’re happy. Merry Christmas.